The whole Brett Favre Green Bay Packers saga during this off-season has had more yawns than an intercontinental sleeping championships, so it with some degree of relief that number #4 has left Wisconsin for the sleepy town of New ‘goddam’ York. This means the Favre saga – a bit like Mr Balboa in Rocky VI – will go a few rounds too many in the ring. The New York media will no doubt waste a small rain forest in paper analysing Brett’s move to the Big Apple, calling him names ranging from the ‘ressurection’ to ‘a grey haired over the hill dreamer’, but face it the New York Jets are NOT a Superbowl ready team like the Green Bay Packers. The Jets have simply not got the defensive talent or the offensive line to make it into the post-season. Thomas Jones is an average starter at best, a non glamorous starter that neither scares opposing teams nor exites home fans. Laverneus Coles is coming off an injury at wide-out, and Jerricho Cotchery is consistent but he is not the man to get you to the final dance. Green Bay was the team Brett should have stayed at if he wanted a shot at the next Superbowl, now he will end his career in some kind of ugly kelly green and white mess on the AstroTurf of Giants Stadium. I will say in here and now on NFLFANINENGLAND that Brett Favre will NOT make the playoffs with the New York Jets. He will potentially throw 3,000 yards in 2008, he may even extend his outstanding consecutive starts record, but Brett will not be tasting the rarefied air of the playoffs let alone the Superbowl. The fact the Jets and Packers agreed a deal that means the Packers get a 1st round pick if Brett makes the Superbowl is not optimistic, it’s downright bonkers. The hype for the Jets v Patriots game in week 2 of the 2008 season will be out of control. The Pats are a team on a mission, and also incredibly the same team that Favre beat in his only ever Superbowl win. I think one man that has been given an incredibly raw deal is unemployed quarterback Chad Pennington, who must have a sore back after being shoved out with one hefty push towards the exit part of the New York Jets practice facility. Yes Pennington did not have an incredible 2007, but he was the NFL comeback player of the year in 2006, and has the NFL record – YES THE NFL RECORD for completion % for all NFL quarterbacks who have attempted a minimum of 1,500 passes – better than Tom Brady, even better than Joe Montana or Steve Young. Now at least we get to see if former Cal quarterback Aaron Rogers is the real deal – thank goodness ! It’s that time of the year when NFL rookies are looking to milk the franchise that drafted them out of every last penny, the time of year when lets be honest not too much is happening – so why the hell do we have to be subject to hour upon hour and column upon column about Brett Favre, the alleged retired quarterback. Yes with the Green Bay Packers he has set a record for consecutive starts that is unlikely to ever be beaten, yes he has passing records, touchdown records, but lets take a look at Favre’s wins in the game that REALLY matters, the Superbowl. One win in his illustrious career, and only two games in the final dance, despite 16 active NFL seasons, is not in my opinion a good enough return. We all know and love Favre for his ‘gunslinging’ attitude, his ability to never miss a game, and even his cheeky smile, but here is one thing you may not know, Favre commited 435 regular season turnovers. I say MOVE ON Green Bay Packers, just come out with a statement saying you will NOT be re-signing Favre and be starting Aaron Rodgers in 2008, and save us, the fans worldwide, even those in England, from more Favre umming and aahhing – even my wife groans when Favre’s face appears on our tv screen. Rodgers could be the next Steve Young, who after living in the shadow of a legend for a long time proved he had a Hall of Fame career of his own. No I’m not calling Aaron Rodgers a legend, but for the sanity of the NFL we need to MOVE ON and give Rodgers a chance to prove himself. NFL Quarterbacks and their pets – prove that the superstars of the NFL do love animals – does Tony Romo have a chinchilla ? Does Donovan McNabb have a worm farm ? We NEED to know ! What happens to players who get cut ? What do they do ? Do they really end up stacking shelves or what? 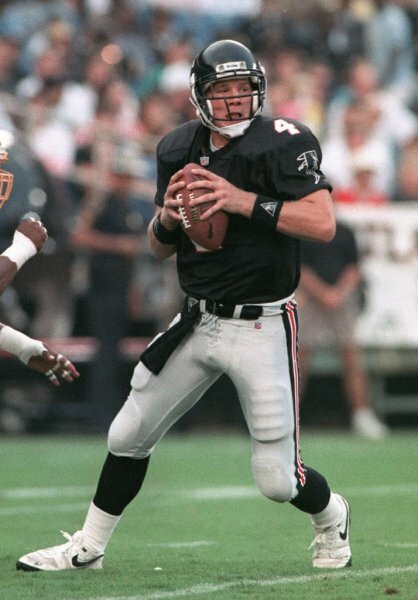 PS – Just for fun I have added a pic of Brett in a Falcons kit (see above). It’s one of sports great ‘What if ?’ questions isn’t it – If Brett started for the Falcons would he have been the same player ?